A few weeks ago, we took a trip with our friends Grace and Sean to Maine. We brought back a couple of lobsters from Three Sons that Rob chopped up and sautéed, Chinese-style. He’ll have pictures of that soon. My crowing achievement was making lobster stock. Now, Rob and I are veterans of stock. We typically make chicken stock from leftover chicken parts and bones after we’ve deconstructed the chicken. This time, I decided to use the leftovers from the lobster, make it into a nice, rich stock and freeze it up in little baggies for future cooking adventures. Today was one of those adventures. Last night, Rob made some chicken tarragon and we ate it sans-starch because… well, we were tired and didn’t feel like cooking anything else. I decided that the leftovers merited some sort of rice, so I decided to go beyond the trusty Tatung rice cooker. Enter… lobster stock pilaf. Elise from Simply Recipes has a pretty awesome recipe for rice pilaf, and I’m going to show you my adaptation for Japanese white rice (the standard I have at home) and lobster stock. I realize for some people it’s a bit of a sacrilege to be using butter and lobster stock with short-grained Asian white rice, but it tastes pretty awesome and is a good, quick fix for the “I’m sick of plain white rice” days. 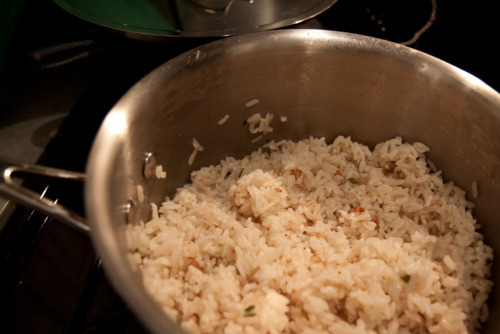 Fluff with fork, use your rice paddle to get some of the crusty stuff off the bottom, and enjoy!